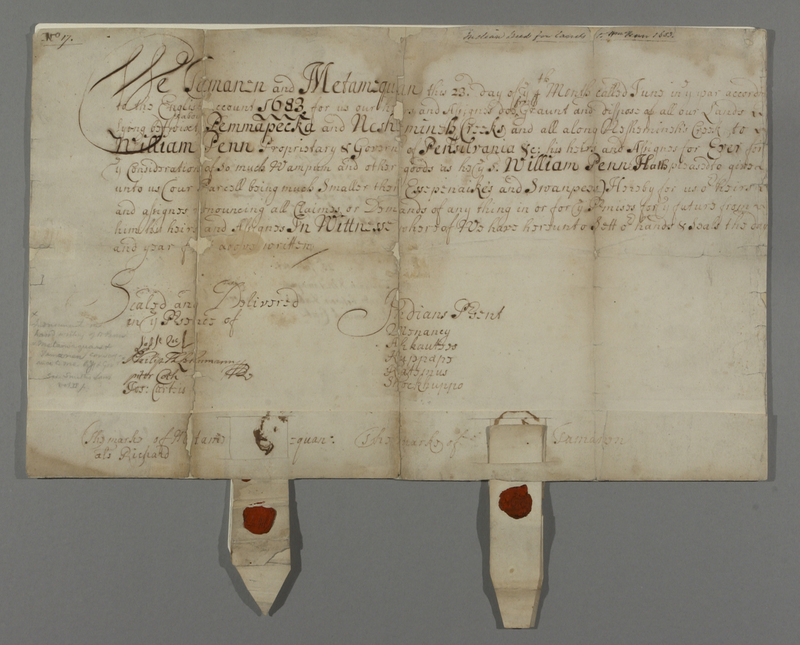 Land Grant with Receipt from Tamanen to William Penn, June 23, 1683.
Credit: Courtesy of the Pennsylvania State Archives. Five purchase documents completed on June 23, 1683, are among the oldest such items preserved in the State Archives. Shown here is the document for Lenape chief Tamanen's personal sale of land described only as being located somewhere between Neshaminy and Pennypacker Creeks near the Delaware River, probably in present day Philadelphia and Bucks Counties. (The name Tamanen, which meant "the Affable," later became "Tammany " and was adopted by a secret fraternal society, the Sons of Tammany in the late eighteenth century. During the Nineteenth Century, the name was used for New York's political machine, Tammany Hall.) It is notable that Tamanen admitted his parcel was smaller than another sold to Penn in the same approximate location, on the same day, and that the purchase price was as many items as "Penn shall please to give." This may explain why the sentence acknowledging receipt was added to the grant, although it too does not give an exact price. On the same date, Tamanen also joined with another Native American, Metamequan, or "Richard," granting jointly to Penn land at the same location, as well as a receipt for payment in specific amounts of trade goods that Tamanen and Metamequan received. Furthermore, ten years later, Tamanen joined with other Lenni Lenape leaders in confirming in another deed that the Neshaminy and Pennypacker Creeks land sales had been final.